I was just thinking over the weekend how far I've come as a knitter as I was sitting in the hotel room with my 2 best friends and watching Florida football and mindlessly knitting. I had been wanting to try for a long time, but could never get past the cast-on stage. Last December I was taught to knit in a bar by a friend that'd had a few drinks. I've tried my hand at scarves, bags, blankets, and now felting. The bag for the Fall Felted Bag Exchange is turning out so gorgeous that I might just have to make one for myself! How often do you change the purse or bag you're carrying? Do you change based on seasons? Outfits? Something else? 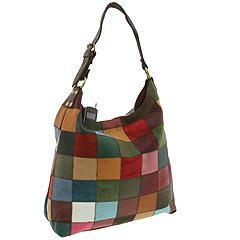 What's your favorite bag in the world (and it doesn't have to be a knit/felted one!)? Prior to Patches: BBN, I used Vera Bradley bags and changed them whenever the mood struck. Since they are extremely colorful and can match most things, they weren't outfit-specific or seasonal. I love any bag that you can wear with brown or black shoes!